Larisa regularly advises the firm’s clients on Tech, Media, and Telecommunications (TMT), and corporate & M&A matters. Prior to joining the firm, she worked as an intern in the Office of the Solicitor General and also in a law firm specializing in Intellectual Property. Larisa joined the firm in January 2016 and is currently a senior associate. She has relevant experience in assisting clients involved in FinTech and emerging media on regulatory, transactional, and corporate restructuring projects and issues. She also regularly drafts, reviews and negotiates tech and IP contracts. 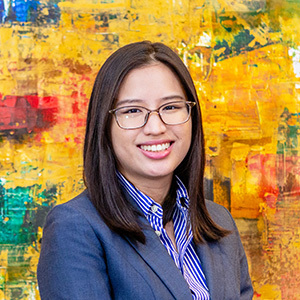 Larisa handles the firm’s legal education initiatives for the growing community of Philippine-based startups. She successfully represented a media company in the Supreme Court where she defended the media company’s fundamental rights to freedom of the press and access to information. The case was unanimously decided in favor of the media company. Larisa has been cited by the Legal 500 Asia Pacific (New Generation Lawyer – TMT) in 2017 and 2018. She has a Juris Doctor degree from the University of the Philippines. She holds a Bachelor of Arts degree in European Studies (major in International Relations) from the Ateneo de Manila University. Larisa is part of the Integrated Bar of the Philippines – Kalinga-Apayao chapter.